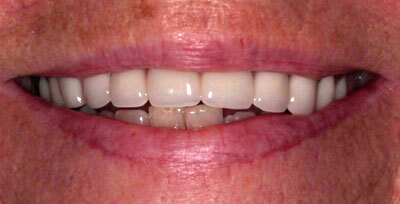 Lisa came in to see us and wanted to restore her smile by replacing her missing teeth. In a few short visits we were able to achieve that result. Lisa is confident and happy with her new smile! “I am a relatively new patient of the practice. I had no dental care until I was 14 years old. I needed a lot of work to fix my teeth at that point. My experience was somewhat negative because of the amount of work needed. I developed a dislike for dental appointment. I had several teeth removed and many fillings. When I married I had dental insurance through my husband’s employer. I went for check-ups and tried my best to use good dental hygiene. It was difficult to get an appointment because they had many patients. It was hard to get in more than once a year. I contracted an auto0immune disease cal Sjorgens Syndrome. It limited the amount of moisture in my mouth. I developed gum disease and lost many teeth causing my need for dentures. The dental plan we had supplied dentures at a reduced price. Then never seemed to fit well. If you needed an adjustment you had to pay a fee each time. I have always used an adhesive to keep them in place. I never knew they should fit without adhesive. There were very few employees who treated you kindly or showed any interest in what you told them. I do not have any insurance now and must watch my expenses. I misplaced my bottom denture so I came to Moorestown Dental after some research. I am very pleased to say that is was an excellent choice. 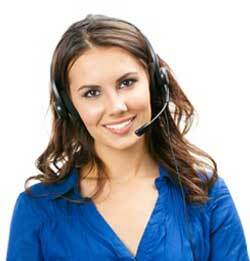 They are very caring and helpful with any questions or problems that arise. I actually decided to replace both dentures because of the confidence I developed in them. This is based on their excellent treatment of me during all visits required for fittings of new dentures, all were prompt and pleasant. 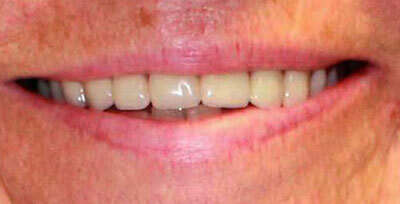 The dentures both fit very well and I no longer have to use that sticky, hard to remove adhesive. I have been told to come back anytime for an adjustment. I know of course there are no teeth as good as your own. I am extremely satisfied with my new smile. I am very thankful for Dr. Rush and her great staff.” – Linda W.